If you're thinking about adding under-cabinet lights, you can forget about those screaming-hot halogen puck lights of the past or even the utilitarian fluorescent tube fixtures that dominated the scene for decades. Today's options are much more energy efficient than pucks and much more streamlined—and also brighter and more consistent—than the old fluorescents. Most under-cabinet lighting available now is LED, which produces more light per watt than any other standard light source. 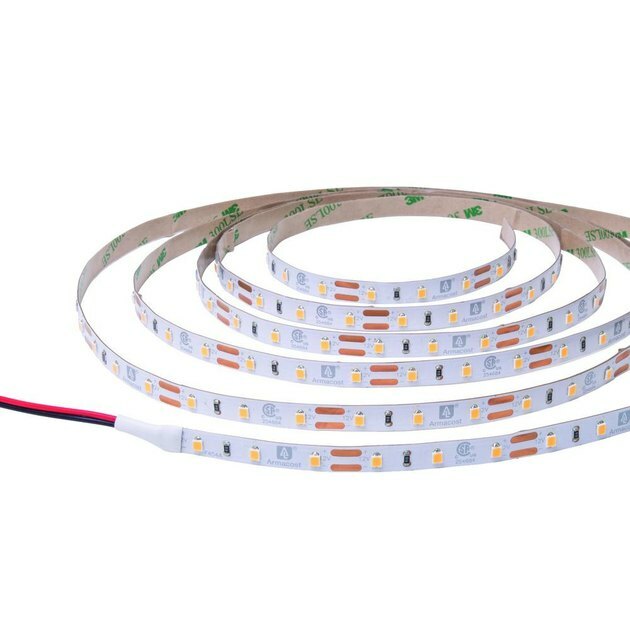 LEDs (light-emitting diodes) are also highly versatile and can be fashioned into thin strips, tapes, ropes, pucks, and various low-profile fixtures. 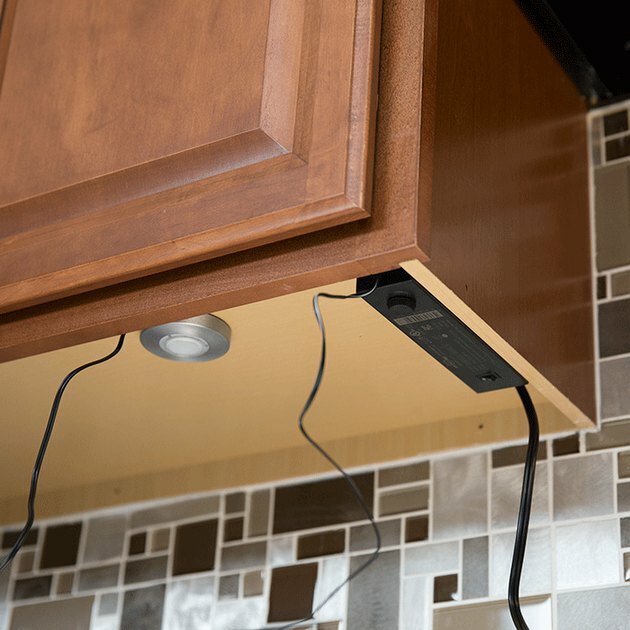 Under-cabinet lighting can be hard-wired and controlled by a wall switch, but most DIYers choose an easy-to-install plug-in system. Undercabinet lighting is both practical and decorative. Options for undercabinet fixtures have expanded in recent years, but you can still find many of the popular standards. Again, the lighting type has mostly switched from incandescent (and its cousins halogen and xenon) and fluorescent to LED. Standard under-cabinet fixtures are often marketed as "streamline" or "low-profile" and come in rectangular boxes and rigid strips that mount to cabinets with screws. They typically produce an even band of light, making them best suited for task lighting that illuminates the counter area with bright, white light. Puck lights are small, round fixtures about 3 inches in diameter and 1/2 to 3/4 inch thick. Early versions of puck lights typically were halogen or xenon and ran extremely hot (hot enough to melt chocolate stored in the cabinet space above the fixture), but today's LED versions run much cooler and offer the same flexibility of placement; the small pucks fit anywhere and can be surface-mounted or recessed into holes cut into cabinet boxes. 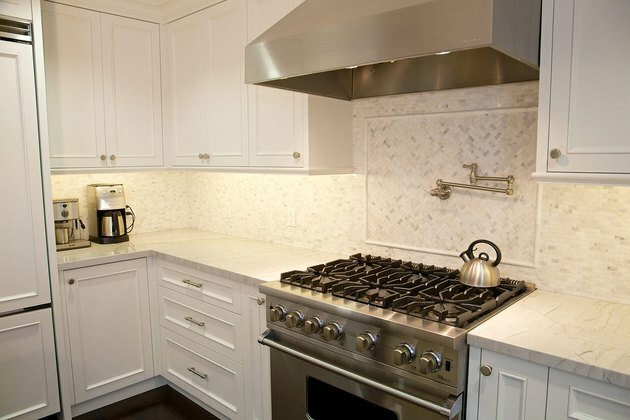 Pucks cast a round beam of light and are often used for accent lighting against a backsplash or above the cabinets. Strip or tape lighting is a flexible strip, about 1/2 inch wide and 1/8 inch thick, that contains a string of LED lights and very thin wiring. Strips are sold in precut lengths and in long roll that you can cut to any length you need. This is the most streamlined, easy-to-hide type of undercabinet lighting, but it's not quite as good for bright illumination as many standard undercabinet fixtures. The strips have self-adhesive backing and are simply stuck in place. 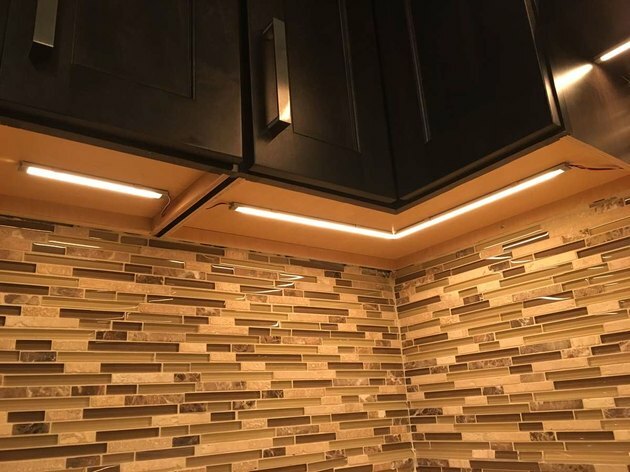 They are commonly used for accent lighting under or above cabinets, or under bar countertops (this is a popular effect in restaurants and bars). They can also work as task lighting. Rope lighting is clear plastic tubing containing tiny fairy lights and wiring. These are the same lights commonly used for decorative lighting on patios and in other outdoor locations. They add a warm, festive glow and are inexpensive and easy to install. In the kitchen, rope lights make the most sense for accent lighting above or below the wall cabinets. Under-cabinet lights are commonly available in either low-voltage or line voltage types. Line voltage means that lights run directly on standard 120-volt household power, just like any appliance or lamp that plugs into a regular wall outlet. Low-voltage lights also use standard household power, but they include a transformer or a "driver" that steps down the voltage to about 12 volts for powering the lights. From a user's perspective, there are really no significant practical differences between low-voltage and line voltage systems. "Low-voltage" does not mean lower energy use (a common misconception). So it's usually not a factor in choosing one fixture over another. However, some types of fixtures, such as strips lights, are only available in low-voltage styles. Hard-Wired, Plug-In or Battery Light Fixtures? Hard-wired under-cabinet lights are connected directly to a household wiring circuit and can be set up for control using a standard wall switch or with a switch on the fixture itself. Wall-switch control is the primary benefit of hard-wiring. It allows you to turn on all under-cabinet lights—or even all the kitchen lights—from one switch. Another advantage is that there's no visible cord running from the lights to an electrical outlet. The downside of hard-wiring is that it involves a much more invasive, complicated and, in many cases, costly installation. It often includes wall repair and/or modification of cabinets. However, if you're remodeling your kitchen or building a new house, installation is relatively easy, so the benefits usually outweigh the drawbacks. Plug-in under-cabinet lights are the most popular choice when you're simply adding lights to a kitchen (not during a remodel). Installation is quick and easy and doesn't require an electrician or really any electrical knowledge. Since most kitchens have lots of outlets along the backsplash, there's usually a convenient outlet to plug into, and many fixtures can be linked so you need only one plugged-in cord. Plug-in lights are controlled by a switch on the fixture or on a separate box that comes with the lighting system, which may include a dimmer. Another option is to plug the lights into a simple switch device that plugs into the outlet and lets you turn on all of the lights at one outlet location. Interconnecting wires are easy to hide along with the fixtures. Battery power is the final option for under-cabinet lights. This makes sense for single fixtures in remote and seldom-used locations, such as a wet bar or a liquor cabinet. Battery-powered lights adhere or are screwed in place, and the battery is inside the fixture. If you go this route, choose a fixture that's very energy efficient and uses inexpensive and readily available batteries, not button batteries or other specialty types. Specific components and wire connections vary among manufacturers and light fixture types, but most plug-in under-cabinet lights are installed with a similar process. Plan the layout of the lighting system, including the location of each fixture (and how the fixtures will interconnect), the location of the transformer (as applicable) and the outlet(s) you will plug into. Transformers and dimmer control boxes can be mounted below or above cabinets or hidden inside cabinets. Configure the fixtures according to your layout. For example, strip lights may need to be cut to length or interconnected to splice multiple strips. Mount the fixtures under the cabinets, using the provided screws or self-adhesive backing. Run interconnecting power cords between multiple fixtures, as applicable. For example, many rigid fixtures (not strips or rope lights) can be interconnected with short cords to "daisy chain" the fixtures together; only the first or last fixture in the line plugs into the power outlet. Secure and conceal all cords to keep them out of sight, as much as possible. 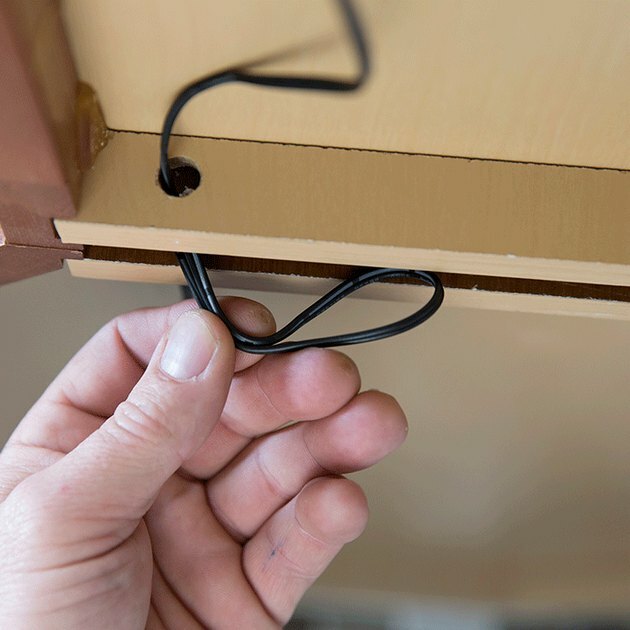 Cords can be fastened under cabinets with small cable clamps or with adhesive, such as epoxy or dabs of hot glue. Run power cords under the cabinet or along wall trim up to a point directly above the outlet, leaving just enough slack to go straight down to the outlet. Plug in the transformer, dimmer control or any other devices, as applicable, then plug in the lighting system at the outlet and test the lights. Transformers can be tucked away in under-cabinet recesses. There are many ways to connect hard-wired lights to the household wiring system, but the simplest option usually involves tapping into an existing lighting circuit in the kitchen, running new cable from an existing light switch electrical box. Another option is to tap into an outlet box that is not one of the countertop (backsplash) outlets. The countertop/backslash outlets are part of two "small appliance" circuits, and electrical code prohibits tapping into these for lighting. Determine the power source for the new lighting circuit (wall switch box, outlet box, entirely new circuit, etc.). Turn off the power to the source circuit, and test the circuit wires to confirm the power is off. Cut access holes in the wall and/or cabinets to fish new cable from the fixture location(s) to the source. This may involve cutting out a horizontal strip of drywall if you must run cable through wall studs. Install a junction box (as applicable) in a hidden—but accessible—location, such as inside a base cabinet or above a wall cabinet. An optional junction box allows you to connect multiple power cables running to fixtures to the source cable at a convenient location. Junction boxes must be accessible; they cannot be covered by drywall or cabinets. Install a switch box, if the lights will be controlled by a new wall switch. Run cable from the source to the first fixture or the junction box, or to and from a new switch box. If applicable, run additional cable from the junction box to each fixture location. Note: Exposed cable must be metal-clad cable or protected by flexible metal conduit (Greenfield). 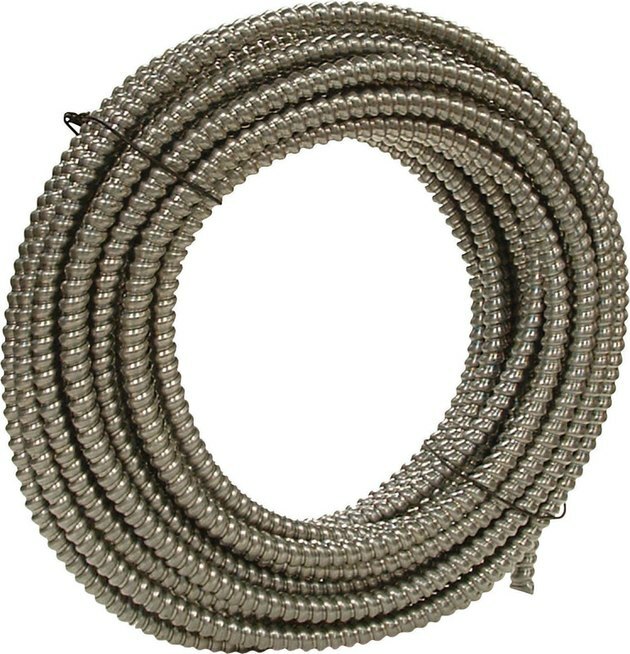 Cable running inside wall cavities can be standard non-metallic (NM-B) cable without conduit. Install the fixtures as directed by the manufacturer. Connect the cable to each fixture, using a cable clamp to secure the cable to the fixture. Wire the fixture following the manufacturer's wiring diagram. Install and wire a new wall switch, as applicable. Secure the cables to the junction box and source box, and make the final wiring connections. Cover the junction box with an approved cover plate. Restore power to the source circuit and test the lighting system. Repair wall surfaces and/or add access panel covers inside cabinets to conceal system components. Use flexible metal conduit to protect exposed cable or wires inside or behind cabinets.